State Sen. Dean Skelos will wait until prosecutors rest their case to make a final decision whether to testify at his federal corruption trial, his attorney said Monday. If Dean Skelos takes the stand in his own defense, he would be subject to cross-examination by the prosecution. The disclosure that the Republican Nassau County state senator and former majority leader is still weighing his options on whether to take the stand came at Monday’s charge conference, where attorneys for the government and the defense hammered out the language of the charges given to the jury. The jury had Monday off. The attorney for Adam Skelos, the senator’s son and co-defendant, has previously said his client will not take the stand nor call any character witnesses. The prosecution intends to rest its case by noon Tuesday, said Assistant U.S. Attorney Rahul Mukhi, and estimates its closing arguments will take about 3 1⁄2 hours. Attorneys for both father and son estimated a similar time frame. Barrella worked for AbTech, one of three companies prosecutors allege the senator pressured to give jobs to Adam while important business interests of those companies were pending before the State Legislature. 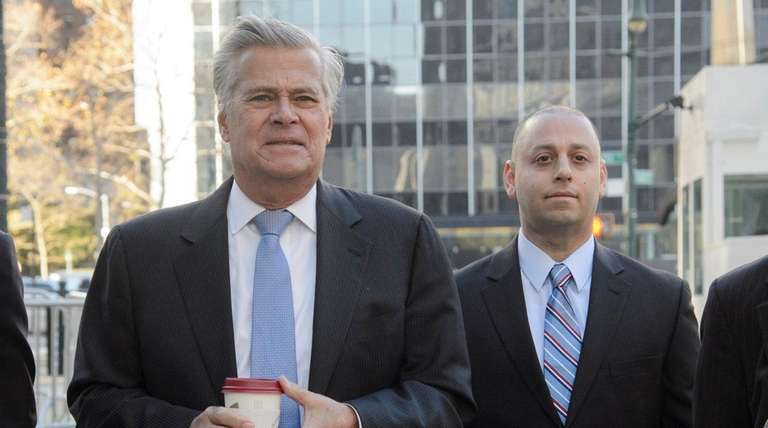 Dean Skelos, 67, and Adam Skelos, 33, are charged with using the senior Skelos’ clout to get Adam work from developer Glenwood Management of New Hyde Park, Roslyn-based malpractice firm Physicians Reciprocal Insurers and Arizona-based AbTech Industries. Dean Skelos and Adam Skelos, both of Rockville Centre, have pleaded not guilty.